The sun was setting over the backyard of the estate, lush rolling hills and hedges were bathed in the familiar swathe of amber; the hedge maze was a tangled mess of shadow and light, a murderous duet that always ended the same way. The balcony was the only proper place to see this sight. As I stood outside, the wind moved my dress around my ankles, not chilling me as much as bringing me out of the deep thought-well I had fallen in. A smirk came over my face. “Thank you, Grant. I was doing a marvelous job of ignoring you before you ruined it with your thoroughness.” I turned around to face my butler. He was a taller man, past midlife, but had always appeared much older to me. The lines on his forehead and cheeks, many of which were forged by me in my younger days and my parents before in theirs, stood out like paths of self-assuredness that always made me feel comforted. I walked towards him, smiling, closing the balcony doors shut behind me. “Dinner is served, my lady,” Grant said. “What is it tonight?” I asked. “Salmon with a garlic butter sauce and green beans,” he said. “Not him again,” I said. I looked down and took a deep breath that made my chest rise as I steeled myself. Grant bowed and allowed me to leave the room first. I walked down the hall towards the staircase, a glazed half-focused look in my eyes, vaguely conscious of footsteps and their echoes. I was aware of what was unfolding and despite everything in me screaming to get out, onward I walked. I still have to keep up these damned appearances, whether I liked it or not. Though they did have their purpose. We made it to the archway before the staircase and Grant walked ahead of me. I lifted my head up and walked out to stand by Grant at the banister. There was a man in the main room, walking toward the bottom of the staircase with the same sickly nature I had come to expect from him. My eyes rolled despite my astute attempts to prevent them. “My lady,” he managed to get out before promptly having a coughing fit into a handkerchief already stained red with blood. My forehead and eyebrows formed that familiar look which Grant tells me reads entirely of utter dismay and disbelief. “His blood would do the soil good,” Grant winked at me. I put my hand up to my face to conceal the grin that formed. “Excuse me, my lady. I promise I am not contagious,” he said. He held out his hand. I descended the staircase with the same elusive and distant grace my mother taught me. Always be here, but never present. People are drawn to empty shells, for then they can fill you with whatever dreams they want. I took his hand and curtseyed. “Of course not, Lord Alptraum. My hounds would never have let you past the gate had you been contagious,” I said. He laughed like a good boy. I knew it wasn’t funny, but I admit the cued laughter still partly stroked my ego. He kissed my hand and placed it in the crook of his elbow. Grant was down the stairs and ushering us into the dining room with the preternatural speed of someone completely adept at their job. My entire household was now encapsulated in one room. Grant, the head butler, was giving orders to the others; Ellie, my maid, was trailing off to the kitchen behind Dean, the cook, while Peter stood in the corner looking lost. As the gardener, Peter had no business being inside, but if Grant calls, they all answer. Lord Gard Alptraum pulled out my chair at the head of the table before taking his seat to my right. “Thank you for dining with me again tonight. I know you have a great many suitors,” he said. “Technically, since you came to my home and are at my table, it is you who are dining with me,” I said. He smiled. “Either way, the outcome is the same and I am very glad for that.” Outside of the coughing fit and his sickly pallor, Lord Gard Alptraum was a man in his early thirties, which made him only a few years older than me, medium build, with dark brown hair that he wore slicked back. His most striking feature was the eyepatch over his left eye. It was the only reason I allowed him to return. Our ages made us something of outcasts in the aristocratic community, though far more for me than for him. A single woman past twenty (let alone five and twenty), no matter how beautiful or rich, is labeled a lost cause. But still, men try. I’m sure Gard thinks my age makes me desperate and therefore willing to overlook his bouts of blood vomit all over my floor; at least more so than a noble girl of normal marrying age. But then, I’ve always been a cynic. “Dean, my chef, has been good enough to prepare a salmon with a garlic butter sauce and green beans,” I said. “How delightful, that’s my favorite meal he’s ever prepared,” he said. Considering Gard had only tasted three of Dean’s dishes, his spectrum was somewhat limited. Gard was the third man this week who came to dine with me. It all felt a bit like The Odyssey, when all those boors barged in on poor Penelope and her grief and demanded to know where she kept the salted pork. Here I was, safe behind my walls, content to ignore and be ignored, and then the men came. Doors are a useless invention. If I want to be behind a wall, there should be no way to interfere with that. I will have them pour a mausoleum around me when I die, that way I’ll finally be free. But then I remembered. Then I laughed. I will concede that doors have their purpose. My eyes widened as they snapped back into focus. “I’m sorry, I wasn’t listening,” I said. “I appreciate your bluntness. It’s quite refreshing to not have to guess what you’re thinking,” Gard said. The staff, including Peter, wheeled carts out and started preparing plates. “Will you be attending Lord Campbell’s Autumn Ball? I hear it will be quite a festive occasion, with music, dancing, food, and even a circus. I’ve always enjoyed circuses. When I was a boy I used to have my palm read by the fortune tellers, but they always said different things. ‘How can this be?’ I’d ask, I mean surely if it was a true art there would be some consistency to the whole thing, they’d simply tell me that the future was ever-changing, and was never the same day-to-day. So I stopped having my palm read after that,” he said. He stared at me, looked at the plates, looked back at me. “I do believe that’s the longest you’ve spoken without coughing,’ I said, smiling at him. He laughed a genuine laugh. There’s no other sound quite like it. It’s completely different from the false and manufactured laugh that most nobles make. It’s a sound that comes from the soul. “I like your laugh, Gard,” I said. He smiled and blushed like a girl. “I believe I’m the one courting you, Lady Charlotte,” he said. I felt my face heat up and looked towards the source. Grant launched fiery arrows at me as he cleared his throat. “The main course for tonight is served, my lady. Please enjoy,” he said. I looked down and placed my napkin in my lap. These stupid men come into my home and I have to be polite and at least accept the first round of their courting intentions but the moment I give one of them a compliment, mind you the one that’s probably going to cough his eyeball out, I get silently scolded for it. Damned if you do, I suppose. I glared at Grant. “Will there be bread tonight, Grant?” I said, enunciating the T sound on the end of his name. “I will inquire with Dean, my lady,” he said. He went through the swinging door that led into the kitchen. “Gard, what would you give to be healthy?” I said. He looked up from his meal with utter surprise. I could guess that Gard had probably been surprised a grand total of four times his entire life. He dabbed at his mouth with his napkin. “Don’t tease,” he said, smiling. “I’m not. What would you give?” I leaned back in my chair and reached for a glass of wine. Gard hesitated for a few moments. He was trying to decide between answering truthfully, for once, or continuing the dance of courtship and saying something coy and polite, but not at all personally revealing. “I’d give anything,” he said. Gard is not what one would call a sure man, but in that moment I knew that out of everything he’d ever said, he meant that statement the most. It was a statement that held so much freedom and normalcy; two things that had always been kept slightly out of Gard’s reach. I drank my wine and looked at the swinging door. I got up in a shot and grabbed Gard’s hand, pulling him along with me. We ran through the dining room, the main room, and several other rooms I never bothered naming. “Charlotte, where are we going?” he said. He kept up better than I expected with my hurried pace, although if he didn’t want to lose an arm, it was all he could do. We finally reached the double doors that led outside into the backyard. I stopped and turned to face Gard, my hand on the doorknob. “If you truly meant what you said earlier, I can help you. Come with me,” I said. I opened the door and went out into the night. I couldn’t pull him any farther. He had to take these next steps on his own. I made it to the bottom of the four marble steps before I heard the door close behind me. I half-turned my head to see Gard limp down the stairs. He stood at my side. “If this is some kind of a joke, this will be the cruelest thing you’ve ever done,” he said. “The night isn’t over,” I said. I took Gard’s hand in mine and walked toward the hedge maze. “I really shouldn’t be outside without my coat,” he said. “Gard, you’re in a hedge maze with someone who told you they could make you healthy and that’s what you choose to focus on?” I said. I looked up and shook my head. “Coming out here was my way of playing along with whatever it is you’re doing since it’s the most excitement I’ve had for some time. Also, holding your hand is nice,” he said. “You can hold more than that,” I said. Gard stopped and I walked a few more steps before turning around. “Now you’re teasing in more than one sense of the word,” he said. “True, but to play the game right you have to have the set up,” I said. I turned around and continued walking. Gard caught up and took my hand again. We walked like that through the maze, his hand in mine, but not saying anything else. He seemed to forget all about why we were out here and was merely enjoying the moments for what they were. Until we got to the middle. 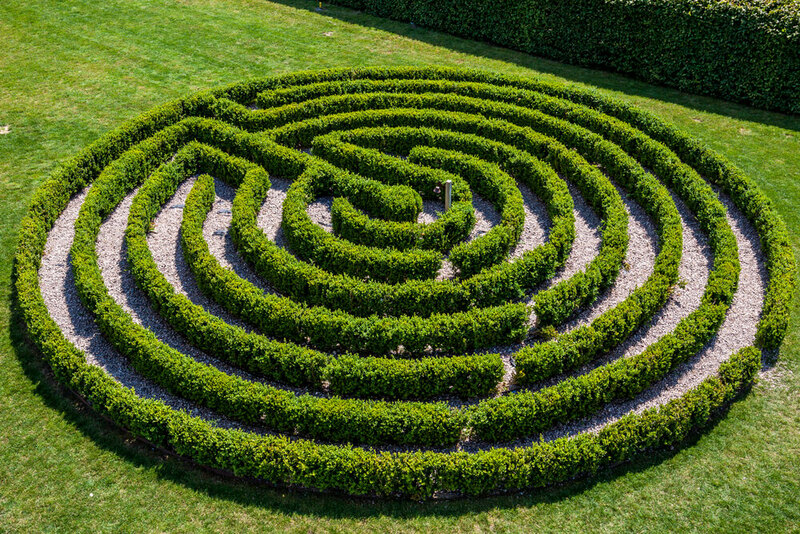 The hedge maze has been on my family’s estate for generations, but each owner changes it. The middle has changed the most. My parents kept statues of themselves here, standing on either side of a small fountain that had benches. It was where they came to feel alone. It’s also most likely where I was conceived. I changed the maze five years ago, when my parents were murdered. I gutted the middle, took the statutes of my parents and moved them to the garden in front of the house, removed the fountain, and had small canals worked in the marble. I kept the benches though, on either side of the archway that made the entrance to the center. Gard sat down on one. “Here we are,” he said. He’d hardly coughed the whole walk here, but that caught up with him as soon as he sat down. “You could be rid of that damn handkerchief forever. You could have strength and vitality the likes of which you’ve never known,” I said. Once he stopped coughing, he dabbed at his mouth with his handkerchief, staring at me the entire time. He said that statement in a surprisingly calm manner. But he believed in fortune tellers. “Something like that, yes,” I said. “What would I have to do?” he said. “You have something very precious, so precious in fact, that the sheer power of it could bring kingdoms to its knees,” I said. He stared at me. After five years, I’m still no good at getting to the point. “Your soul, Gard. In exchange for your soul, I can give you whatever you want,” I said. He stood. “You’re insane,” he said. Apparently being a witch is much more acceptable than what I was. He turned to leave, but the center entrance had closed. There was no way out anymore. “What have you done?” he said. He whipped back to face me. People’s movements become so savage when they feel trapped. “I have done nothing,” I said. “The entrance has closed because you do not truly want to leave. All you have to do to make it reappear is to want it,” I said. He turned back to face where the entrance should be. But nothing happened. I smiled and began to pace on the other side of the middle, running my hand along the hedge. Gard hung his head down, I thought I heard a stifled cry or two, but he kept his composure for the most part. He turned back to face me. “I still don’t understand. What’s involved in this whole thing?” he said. I kept pacing back and forth, forcing Gard’s eyes to follow me. “You tell me what you want, I make a small cut on you, your blood fills the canals in the stone and then you will have your desire made reality,” I said. “That’s all? I thought you wanted my soul. Not my blood,” he said. He became contemptuous now. I could tell he wanted to spit at me and curse the day he ever saw me; curse the vile day he ever thought it would be a beneficial plan to pursue me. People experience an entire gamut of emotion when confronted with their heart’s desires. I stopped pacing and faced him. “Your soul is mine when you die, the blood binds our agreement,” I said. “I still get to live a long life?” he said. “Your life will not be shortened by the deal you make with me,” I said. “That sounds like a suspicious answer,” he said. “The future is ever-changing, Gard, remember? I can’t tell you how long you’ll live because I don’t know. But I can promise you that your life will not be shortened by even one minute because of our arrangement,” I said. His eyebrows were so furrowed one seemed to be overlapping his eyepatch. He was contemplating: did he really have it in him to do this, to reach out and pluck the thing he always wanted. They always did. People want to believe they’re much higher than their desires, but if you find the right whip to crack, they fall to their knees crying and begging for the taste. “Can you make me completely healthy? No more coughing, no more anything. I don’t even want to catch a cold for the rest of my life,” he said. “You have such low standards, Gard. Of course I can do that,” I said. “Can you make me strong as well? Not inconceivably so, but the strength of a healthy and virile young man,” he said. I laughed. Not inconceivably so. For some reason, that struck me. Usually people list specifics for a good few minutes about what they want. Gard simply wanted to be healthy. Healthy and normal. A chance at the life he’d been robbed of until now. The space in my chest tightened for a moment and I looked down and shut my eyes. I hadn’t felt this feeling in a few years. Gard didn’t deserve this. He deserved to live a life without the taint and burden of knowing that he was eternally damned. But does he not also deserve to be healthy? To find a wife of his own, choosing instead of being forced to pursue unwanted creatures? I clenched my shut eyes tighter to try and block out the reasoning. “Once you have your health, will you be able to live with what you’ve done?” I said. I heard Gard fall to his knees. I opened my eyes and looked down on him. “I have wished and waited my entire life not to be sick. I bargained with God. He did nothing. He took none of my illnesses away, relieved none of my symptoms,” his voice started breaking, “now you come along and tell me you can make everything I’ve ever wanted a reality and erase everything wrong with me.” He lifted his hands up and started laughing as he looked up at the starless night sky. “Yes, Charlotte, I can live with that,” he said. “So it shall be,” I said. They really are all the same. I walked a few steps so that I was dead center in the middle of the labyrinth. Gard stood and walked toward me. “Roll up your sleeve and hold out your left arm,” I said. I ran my hand vertically in the air to make the knife appear. I grasped it. I took Gard’s arm in one hand and held the knife in the other. Gard instinctively understood. “I give my soul to you, X, in exchange for what I have asked for,” he said. “And so it shall be,” I said. I flipped him around so that his back was facing me and lifted up his shirt. I dragged the knife in a horizontal line across his back. The magic in the air mixed with his blood and made it stream and splatter neatly to the marble floor, making its way into the canal. The mixture of blood and magic filled the entire design the canals created: my family crest. The magic funneled around us and settled down like a dying dervish. I removed my hand from Gard’s back. He took a moment to recover before scrambling a few steps away from me. He turned to face me. “What the hell was that? What was wrong with my arm?” he said. He cried now and made no attempt to hide it. “Because this is what you have done. You won’t be able to see the brand on your back without a mirror, but the woman you marry will have to see your decision every day for the rest of your life,” I said. Gard’s eye widened as all of his facial features scrunched to try and make sense of it all. “But at least now I can have a wife,” he said. “You could have had a wife without this,” I said. My shoulders lowered as I raised my head. I said nothing. “I enjoyed your company and yes, seeing as I had no other options, I would have proposed. But this gives me options. I don’t have to pursue spinsters and women who would be glad to have the opportunity of marriage at all, women who—” he paused. “I’ve never experienced air like this before. My lungs work so easily, so naturally. I don’t feel weak or tired anymore. I feel exactly the way I imagined. Nature was unkind to me, I should have always felt this way. Now I can live the life I want without being corralled into an unwanted situation because of my condition. I’m free,” he said. “For now,” I said. I waved my hand and the entrance to the maze reappeared. “Thank you,” he said. He turned and walked away. I stared at his back until he was out of sight. I sank inward, descending the long shaft downward. I wanted to keep going until there was no way I could get back out. The voice accelerated me to the top floor and back to consciousness. “It crossed my mind,” I said. The voice came from a swirling shadow, which then materialized into a man. “You still have to work on crossing the border and laying the price down,” he said. He was a very tall man, with arms slightly too long for his body, angles too sharp, and skin too pale. He was too much wrong of everything. His black hair hung over his ears, but then spiraled up to form two horns on his head. He wore no clothes; his body was enmeshed in a shadow that trailed behind him like a long cloak. “I know. I’m not in the mood for a recap at the moment,” I said. I walked and sat on the bench. I rested my elbows on my knees and hung my head down. “Come now, you don’t have a heart to break anymore,” he said. I looked up and glared at him. “It’s not that. I’m just tired of not being surprised by people,” I said. “I told you, if you can get them to take those steps, they’re as good as yours. They all act the same after that,” he said. We stayed there in silence. “However, I do feel the need to remind you about keeping your word,” he said. “Then how do you explain that last bit?” he said. “I told Gard that his life would not be shortened by his deal with me and it won’t be,” I said. “Yet you provided Gard with an illusion. He is wandering lost now through a maze with no exit,“ he said. “The magic that allowed me to create that maze is the result of my deal with you, not of his deal with me. I kept my word to him, he will be healthy and strong until his dying breath,” I said. The demon smiled.“I’ll tell you again, Charlotte, I truly think you were born for this. Humanity is wasted on you. I can’t wait to experience your ways when you die and fully evolve to my kind. Tell me though, do you plan to make him wander until he has that dying breath in your labyrinth?” he said. Read more articles by Katherine Moran. All original work attributed to Katherine Moran © 2017 Katherine Moran.